Liber cure cocorum, or Book of Cookery, is a peculiar little recipe collection dated to about 1420 to 1440. It survives in Ms. Sloane 1986, a collection of medical treatises now preserved in the British Library; Liber cure cocorum is but an appendix. Þis hasteler, pasteler, and potagere. The work of the kitchen is divided into þrinne degre (three roles) – hasteler (meat roaster), pasteler (pastry maker), and potagere (vegetable cook) – based on the main ingredient. The poet then lists out the structure of the book: he shall treat each type separately and proceed al by rawe (by category), marking each dish numerically. To cook, so it seems, is like writing: both must be proceeded in an orderly and systematically fashion. 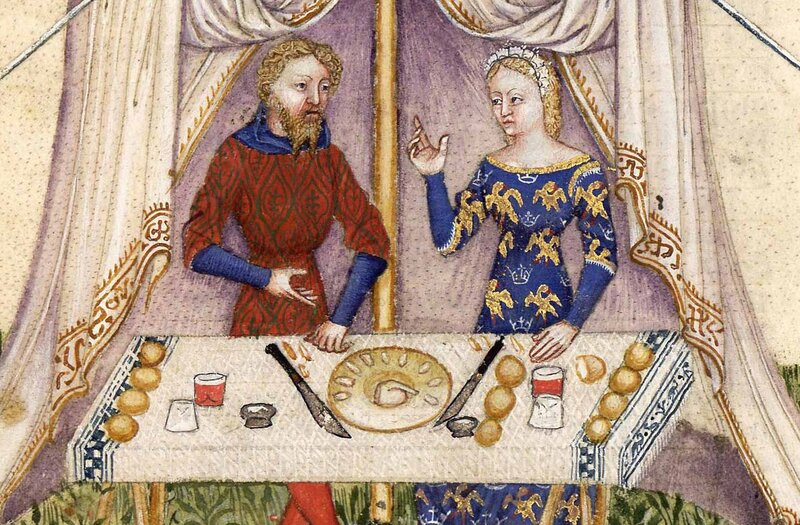 Although the Liber attracts more scholarly attention for its linguistic value (since it was composed in a fifteenth-century Northern dialect and supplements our Middle English vocabulary), it would be unfair to dismiss the recipes, especially when some of them are among the most celebrated (and delicious) dishes. It is Burns Night, so it is only right to start with the haggis! The recipe given in the Liber is in fact the earliest for the much-cherished Scottish dish. Loke hit be saltyd for gode menne. Isope and sauge I wot by þe rode. And fylle þy bagge þat is so gode. And serve hit forthe, Syr, at þe mele. First you pinch the crust that you have already made, pour the meat mixture in, add died currents, salt, and mixed sweet spices (powder dowce). Then mix in eggs and cover it well. Now it is ready to serve. Let hit boyle and cast salt þerin and messe hit forthe. First, shell off the oysters and boil them in clean water. Mix grounded pepper and saffron with bread and ale. Boil the oysters in the broth, salt the mixture, and voila – serve it forth. To be cut and eten with ioutes in fay. This soup is made of cabbage, borage, parsley, plumtree leaves, along with many other pot-herbs. Boil them and ground them with a mortar. Boil again until the mixture becomes a thick broth. The soup can be served with slices with meat. The richness of herbs in this particular recipe indicates its medicinal nature – perhaps this is why the Liber is appended to medical treatises in the manuscript. After all, we are what we eat; to maintain a healthy diet is essential to keeping the body in balance.